By the time you’re reading this, you may already know that Punxsutawney Phil saw his shadow today, thereby warning residents of Pennsylvania to expect 6 more weeks of winter. Here in Canada, Nova Scotia’s Shubenacadie Sam did not see his shadow, nor did Alberta’s Balzac Billy, giving us some hope that winter’s end is around the corner. But Ontario’s Wiarton Willie swung the prognosticating rodent pendulum back to the middle by concurring with Punxsutawney Phil and predicting 6 more weeks. It’s fun to entertain these superstitious notions, but you may be wondering, where do they originate? 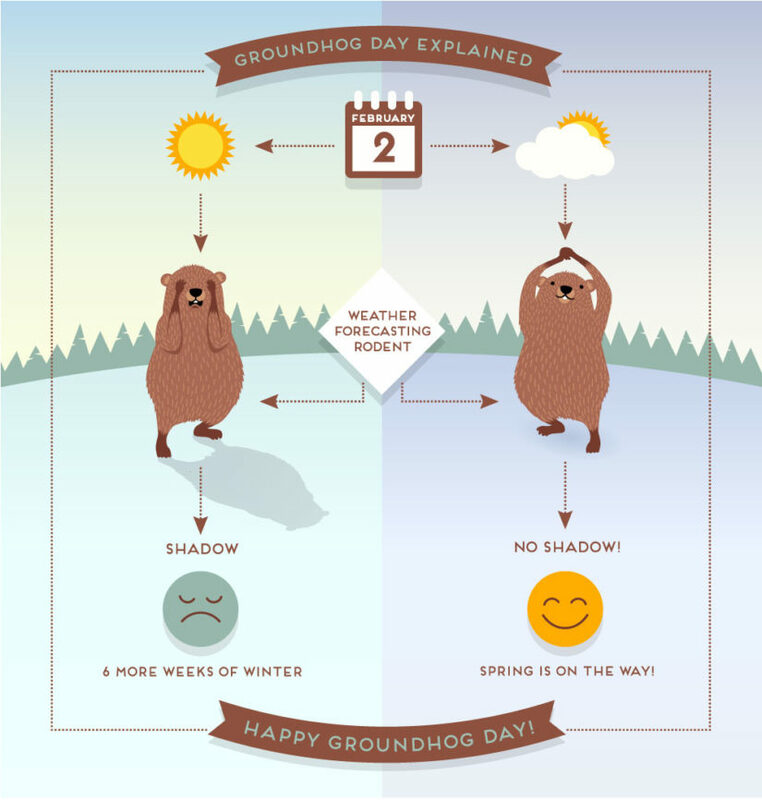 Read on to learn about the history of Groundhog Day in North America. Since at least 1886, people in the United States and some parts of Canada have anxiously awaited the emergence of a rodent to determine whether they will have to endure six more weeks of winter or whether spring is officially upon them. While the act has become a little bit of superstition mixed with a lot of fun and fanfare, the tradition of Groundhog Day has its roots going back well before Canadians and Americans began to observe it. An old Christian celebration that marked the midway point between the winter solstice and the summer equinox, Candlemas was a European tradition dating back to long before the 1886 official observance date. During this celebration, local clergy members would bless candles that were much needed by their parishioners to get them through the dark winter months. Then, they distributed the candles to get them through the rest of the season. The German tradition added its own little twist to the superstition revolving around the celebration, which was believed to have been passed down to the German people by Roman conquerors. They would present a hedgehog to help determine the weather conditions. If the day was clear and sunny, the hedgehog would emerge to find his shadow and the prediction of a long or secondary winter would be proclaimed. However, if the hedgehog emerged for the celebration on a cloudy day, he would not see his shadow, and the prediction would be that spring would come soon. As settlers began to travel to seek a new life in the New World, the area of Pennsylvania saw a large influx of German settlers during the late 19th century. The new residents brought with them the old traditions, though with a lack of hedgehogs in the area. The new tradition was switched to a groundhog, an animal they were more likely to find in their new home. It was The Punxsutawney Spirit, a local newspaper in the Pennsylvania area that help set the roots for what the United States observes as Groundhog Day today. The observance was first announced in 1886, and the following year, a celebration was in full swing as the Punxsutawney Groundhog Club began their official celebration at Gobbler’s Knob, where the first famous Punxsutawney Phil made his debut as the United States premier rodent meteorologist. The original event and celebration started as a local gathering at area farms, but it has grown today to an event where thousands wait for the emergence of Punxsutawney Phil’s offspring to come out and make the famed weather prediction each year. With celebrations growing each year, the annual tradition has now turned into a celebrity-studded event that makes Groundhog Day a much-anticipated event in Punxsutawney. A statement by the groundhog during the Prohibition era observance, where he proclaimed he would order 60 more weeks of winter unless he were allowed to imbibe. In a show of support for the United States bringing home the Iranian hostages, Phil emerged wearing a yellow ribbon on February 2, 1981. Along with Groundhog president Jim Means, Bill Null, and Al Anthony, Punxsutawney Phil made his first trip to Washington to meet President Ronald Reagan in 1986. After the 1993 movie, “Groundhog Day,” visitation during the celebration reached an all-time high of over 30,000 visitors. With advancing technology, Phil made his first debut in New York City’s Times Square on the Jumbotron, where Pennsylvania Governor Ed Rendell marked the first attendance of the state’s governor to the celebration. Members of the Inner Circle, along with Phil, traveled to Indianapolis, Indiana, to participate in the college basketball March Madness activities. Phil traveled to New York for the filming of the coin toss, which he and his handler administered during the XIII Annual Puppy Bowl put on by Animal Planet. In 2016, a special documentary was created and aired on Groundhog Day where the origins and the story of the Groundhog Day celebration were discussed. Whether you are hoping an early spring season is on the horizon, or you are a winter fan and want the season to stay its longest, the dueling predictions from today’s groundhog observations let you choose which you prefer to believe. If you enjoyed this, you may like to read about some common myths about Groundhog Day.